This English bad guy ale has hints of tobacco, toffee, and a touch of leather. Co-owner Todd Dimattio told me that he rotates one of his yeast strains between this mild ale and another of his IPAs. 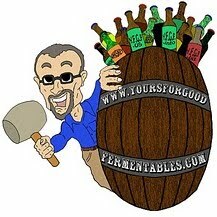 "Is that to keep the mild ale yeast viable?" I asked. "No," Dimattio replied. Between in-house and off-the-premises sales, Rocksteady is one of his top sellers. REquired for this day and age, the brewpub does indeed brew hoppy beers, high 'gravity' beers, and 'sours,' as well. In fact, a patron at the bar said that one of the sours on tap tasted like a fruity, puckering lemonade. 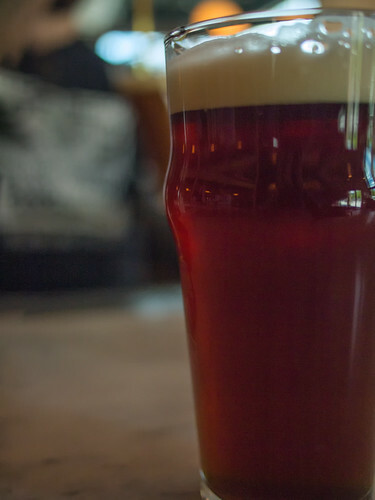 But Rocksteady Mild —ruby red, not hazy, tasting like a suggestion of toasted bread with a schmear of Nutella, more-ish at only 3.4% alcohol-by-volume (abv)— was (is) a rare thing of 'sessionable' beauty. For one brief moment, the rosebush blooms splendidly in spring. Thereafter, only thorns. Here, observing that with an inexpensive CCTV lens (created for small closed-circuit security cameras) but retrofitted with a C- mount adaptor to fit the (micro four thirds) camera. Why do I mention that? Observe those bokeh balls to the upper left. the blurred quality or effect seen in the out-of-focus portion of a photograph taken with a narrow depth of field. 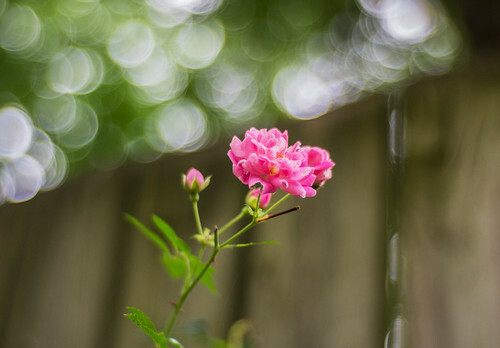 Good bokeh is smooth and pleasing, whereas bad bokeh produces a jagged and discordant effect, largely dependent on the construction of the lens. From the Japanese, boke, for "blur, haziness." These are the same beer! 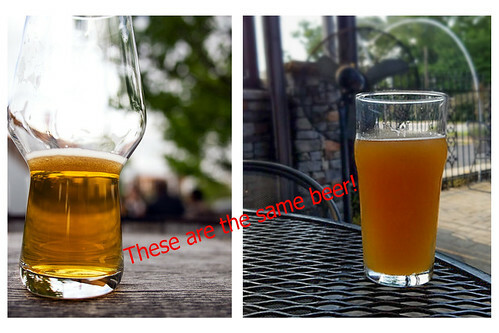 These are photos of the same 'craft' beer. On the left, an IPA, on draft at a brewery. On the right, the same IPA, insouciantly poured on draft at a pub less than one mile away. Somewhere in Georgia, USA. 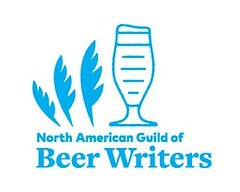 By the way: happy American Craft Beer Week, 14-20 May 2018! 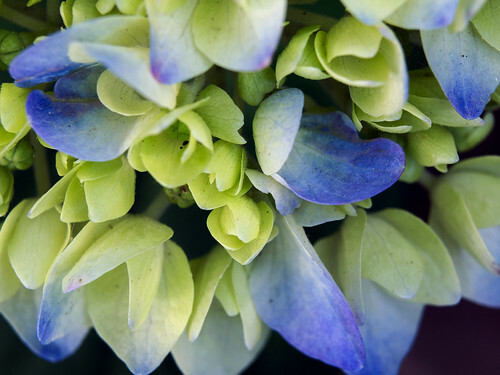 Pic(k) of the Week: Hydrangea blooms blue. Hydrangea macrophylla —also called bigleaf hydrangeas and mophead hydrangeas and French hydrangeas— are a staple of the American South, such as this one in Atlanta, Georgia, the petals of its inflorescence only beginning to turn blue on 7 May 2018. 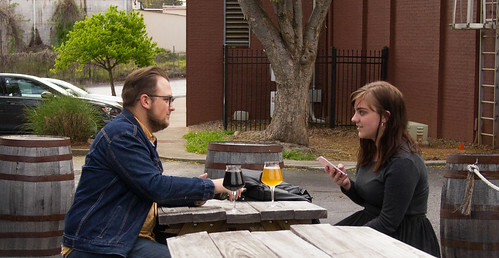 They came to meet as far as Decatur, and the Three Taverns Craft Brewery, Decatur, Georgia. Outside, on the brewery patio, on a Sunday afternoon, 8 April 2018.